I'm sure you've heard the saying: You just need to take it one day at a time. It's pretty solid advice! Now the key question we have to ask ourselves is do we actually implement this strategy as we set out towards our goals. I think that many times we set a big goal or we face a challenging life circumstance and we get intimidated by the size of the task in front of us and we freeze up....and we never truly get started along the path. Today that changes my friends! 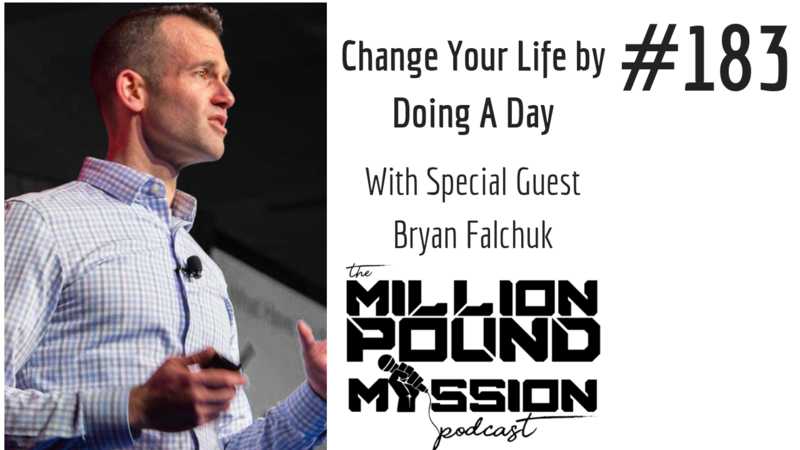 I'm bringing in my friend Bryan Falchuk to teach us how to "do a day" and start making consistent progress by changing our mindset! Bryan Falchuk is a motivational speaker and author who overcame adversity, lost nearly 100 pounds, ran a marathon, and became vegan all by creating an approach to living a healthy life that he calls Do a Day. His personal rock bottom moment and why he decided to turn things around. The Do A Day philosophy and how we can start applying it to our lives. His suggestion for a first action step for someone that is stuck in a rut and is ready to break out.